Big Bend of the Colorado State Recreation Area was opened as Nevada's newest state park in 1996. However, construction of facilities is still going on and certain areas are just not open for public use yet. The park includes about 2 miles of the western shore of the Colorado River, just below Laughlin (although the park is still within the Laughlin city limits). Being just downstream from the Davis Dam, the river is cool and clear here. And while the Colorado River is the main attraction, a large part of the park area is filled with canyons and washes with beautiful rock formations and scenic view points. There are now four miles of established hiking trails open to the public. Hikers also have access to the canyons in the undeveloped areas west of the Needles Highway. 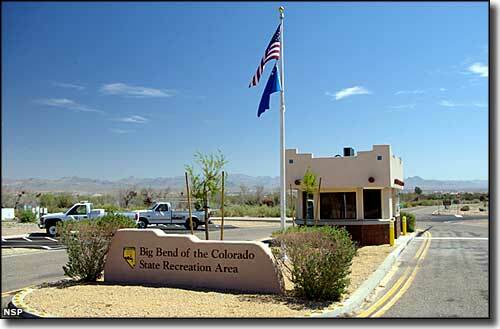 Big Bend of the Colorado State Recreation Area offers 24 RV campsites, all with power and water available. Most sites have pull-through parking and can accomodate virtually all sizes of RV. Each site also has a tent pad, barbecue grill, shade ramada and fire pit. Three campsites are reserved for those folks with valid ADA permits. The camping area also has central restroom and shower facilities. As for picnicking, there are some shade ramada's located along the shoreline in both the boat ramp and day use areas. Some ramada's have BBQ grills and picnic tables. If you are using the boat launch facilities, keep in mind that boating and fishing on the river are regulated by Arizona, California and Nevada. You'll want to be familiar with license requirements and regulations for all three states. Entry fees: $9 per vehicle per day for non-Nevada residents, $7 per vehicle per day for Nevada residents. Camping fees: $20 per site per night for non-Nevada residents, $18 per site per night for Nevada residents. In addition, use of any of the hookups adds $10 to the nightly cost. Photo courtesy of Nevada State Parks.